The picture is full of optimism and joy. 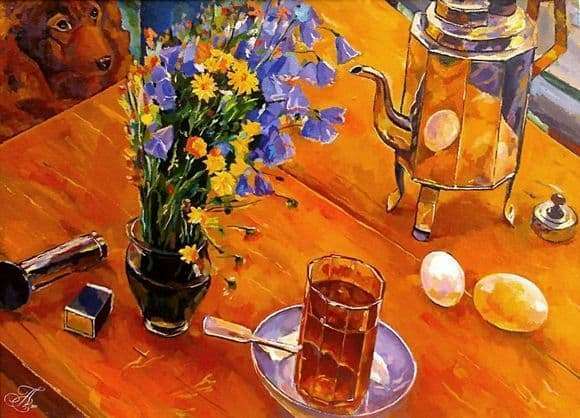 Before us is a glass of tea and two eggs, a modest bouquet of flowers and a teapot. Cloth expressive and internally dramatic. It seems that everything happens on the terrace in one very sunny morning. Before us is a table of light brown wood, which the artist depicted obliquely. It seems to the spectator that one more instant, and all objects standing on it will surely slide downwards. Most of the items are made of glass or metal. This is necessary so that they can play and sparkle in the rays of the sun. The artist creates unusual spots of light on the table top, saucer, teapot, vase, glass and even a spoon. Each item is necessarily reflected in the other. For example, in a teapot, we can see the reflection of an egg, which is magically superimposed on a reflection of a cat of fiery red color. You can also see a dog looking out from behind the table with a friendly, intelligent face. The artist masterfully draws each item. So traces of dew on the table create a feeling of freshness in the summer morning. There is no person in the picture. But you can guess in all its mandatory presence. Who could pick fresh wildflowers? Who is the dog looking at? Whose cat can be reflected in the kettle? Who else can belong matches, lying on the edge of the table. Of course, man. Petrov-Vodkin specially painted the whole still life so that we were just at the place where the person is sitting – the hero of this canvas. We see a small sketch of life in the country. We are captivated by the optimism of the artist and honesty. He looks at life wisely and kindly. It really is captivating. The picture is simple and uncomplicated. It creates an incredibly pleasant feeling that arises after a walk in nature. The masterpiece is filled with bright colors, purity and peace. It feels maximum unity with all of nature.